An antique Morris chair is still widely popular these days, both as an antiquity collection and home furnishing. In fact, it doesn't look a bit out of place because it perfectly blends well with both modern and classic home interiors. An antique Morris chair exudes that laid-back feature that makes any indoor or outdoor living spaces comfortable and homey looking. 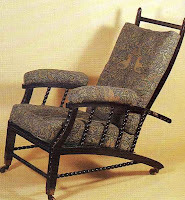 Morris chairs were the ingenious creation of William Morris. When these came out in 1869, Morris chairs became highly popular - these were the very first reclining chair of their time. These were particularly popular in England during the Victorian era. In fact, these were so popular that these were replicated by many furniture makers from that time and onwards. These also gained great recognition during the Arts and Crafts movement in the early 19th century. A typical Morris is simple in their overall features. There are no elaborate woodcarvings on its structure, just clean edges and dark-stained woodwork. It has high armrests with no upholstery while the back and seats are fitted with cushions. But the main highlight of the whole design is its reclining back, which served as the basis of modern reclining chairs. Its reclining back is able to adjust up to 5 levels of tilting positions through the wood indentations carved on the back of each armrest. You might also be wondering if what era Morris-like chairs with hand-carved lion paws belong to. Well, these are actually made during 1890's to roughly around the early 1900's. These were manufactured and distributed by the Royal Easy Chair Co. Their Morris chairs are famously referred to as the ones with a push-button reclining system. Perhaps, the most famous versions of the authentic William Morris chairs are the ones made by Gustav Stickley. He was actually a trained stone mason, but decided to concentrate on woodwork. His different works of Morris chairs were mostly fitted with very wide paddle armrests with a row of slats at each side. Most of them have leather upholstery on the seats or back rests - rarer kinds could also have none. 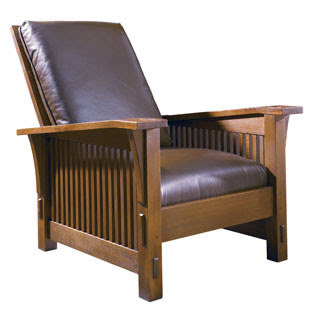 If you're serious about buying an antique chair, you might as well stick with the ones made by Gustav Stickley. The latter option is a lot easier to find compared to the ones made by William Morris and his company. Just make sure that you actually know what you should look for when buying these antiquities. And that should mean doing your research and familiarize the details of the authentic types. While you're at it, learn also the exact reasonable price range of authentic Morris chairs on the market. The ones made by Gustav Stickley could easily sell for $8,000 to $16,000 or more. As with other antique furniture, these chairs are evaluated and priced according to their ownership history, condition, and estimated age. Make sure that you pay attention to these details, so you won't end up paying thousands of dollars on an antique Morris chair that you don't want. Brings out the classic beauty in it. Your article made me have moved a long absence, I wish you have a Good day, which used to come to my Homepage cheap football jerseys to welcome free. Life is really an unpredictable. I am looking few tips for buying boardroom furniture & got some useful tips from this post.Thanks for sharing this post. Nice post, Thanks for sharing....! I like these furniture. If you have knowledge about decorating Bed Linens please share. Really Good Blog , thanks for sharing such a nice information. We are providing Luxury furnitures and sofas , chairs. Buy Best prices Visit Below Links. Nice sharing. Great article. SM Furnitures is the leading Furnitures dealers in Chennai. We give the Good Quality and High Finishing Work for all Modular Furniture Manufacturers in Chennai.online Shopping Available. Incredible Discounts. Interesting Blog Article. I have never heard of Morris chairs, learnt about this new product like the article is saying it’s popular in London. It’s very difficult to find such unique article. Even India has its Popular Furniture Manufacturers in Delhi Ncr with unique designs.